You hear about quality time, but I’m a big believer in quantity time. Some of my best times both as a child and a parent occurred as pure luck. The more time you spend together, the more likely it will suddenly turn out great. This was one of those times. 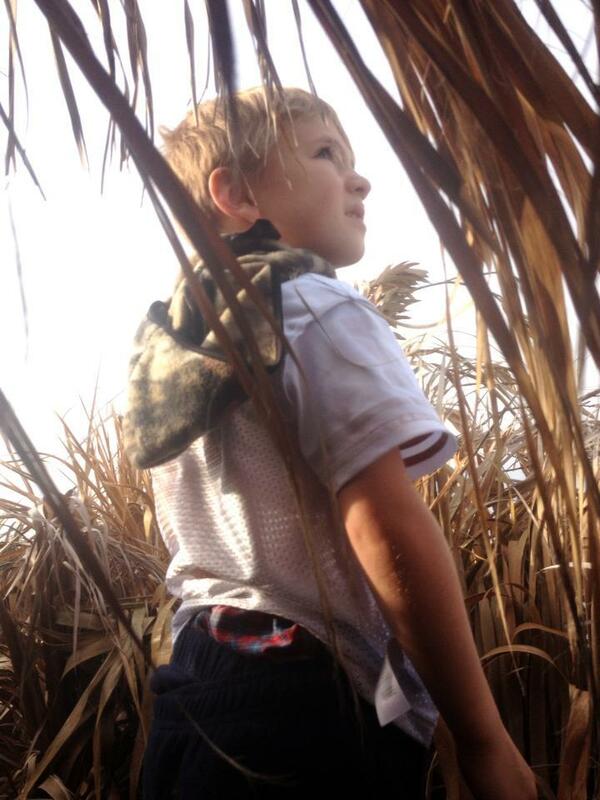 For my little guys, action is the name of the game when it comes to the outdoors. 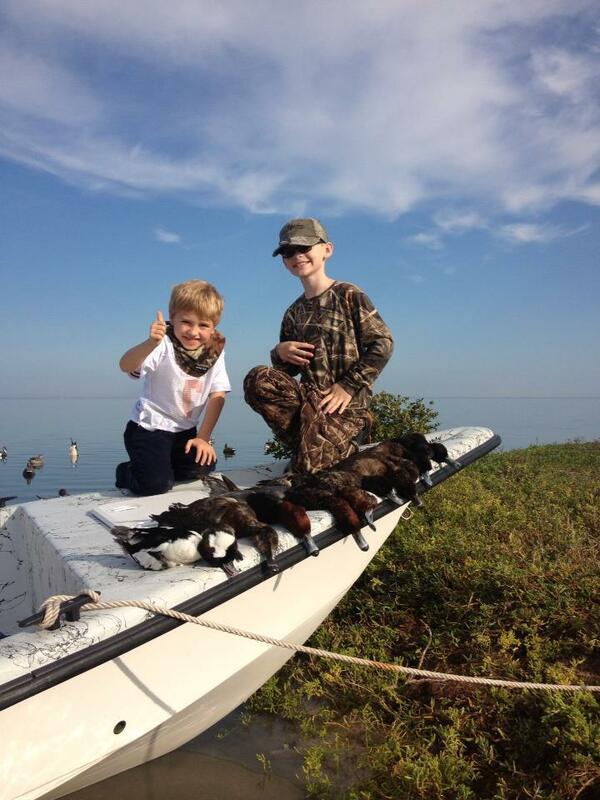 Duck hunting is a fabulous way to break them into the hunting and with duck season around the corner, I hope you’ll take some little guys or gals out hunting with you–though it may not seem easy or even practical. 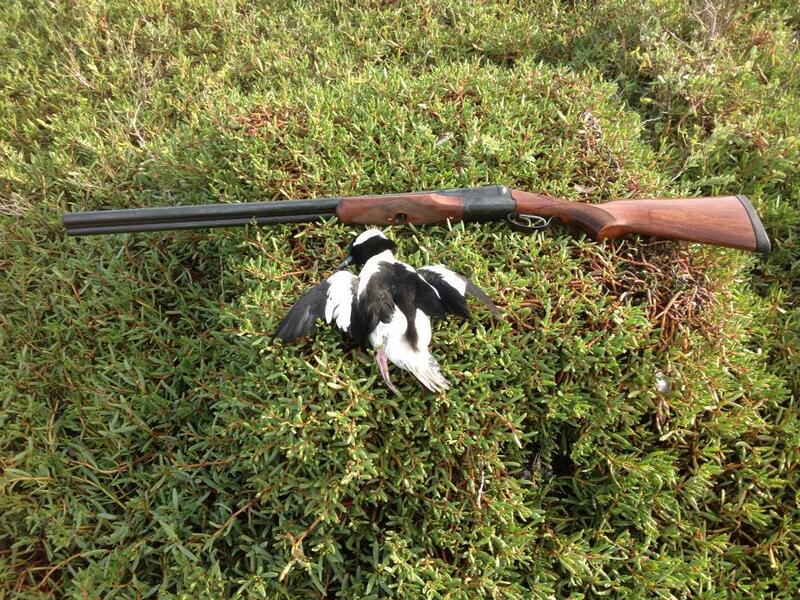 Some hunts lend themselves particularly well with bringing munchkins. A dove hunt is simple: make sure there is plenty of shade, hydration and their BB guns. Toss in some OFF, sun tan lotion, and long pants and you will be good to go. 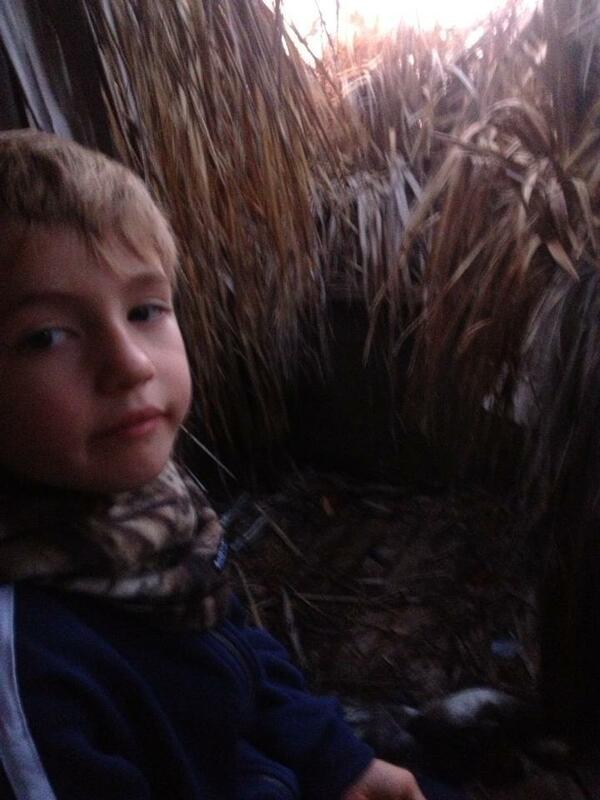 Even deer hunting, when done out of a spacious box blind shielded from the elements is a good way to hunt with kids. My guys love playing with the future food. I encourage it–makes them a little more manly. But duck hunting takes a little more effort. 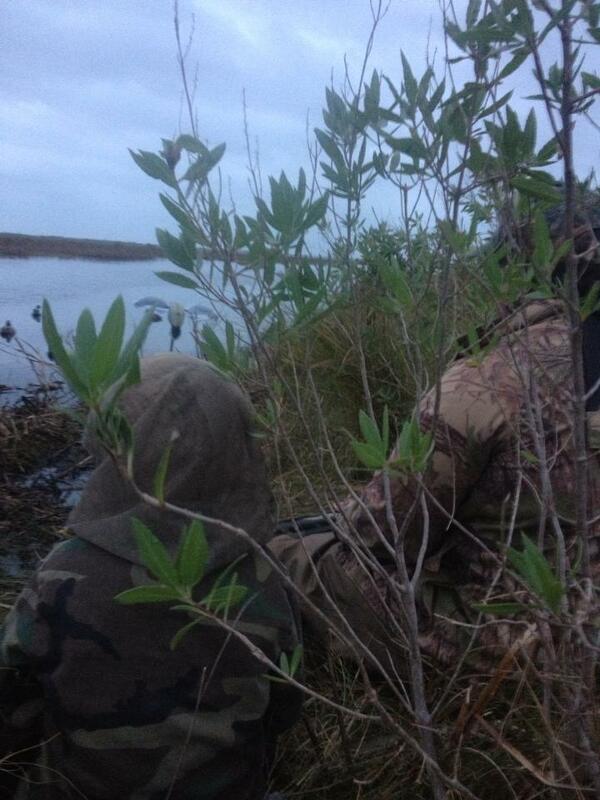 Water, cold, nasty weather, mud–mother nature doesn’t pull any punches during duck season. Throw in waking up way before the posterior end of dawn, and its easy to see why many Dads just choose to let their kids sleep during Daffy Season. Forgetting his gloves cut this hunt short. He was a trooper though. 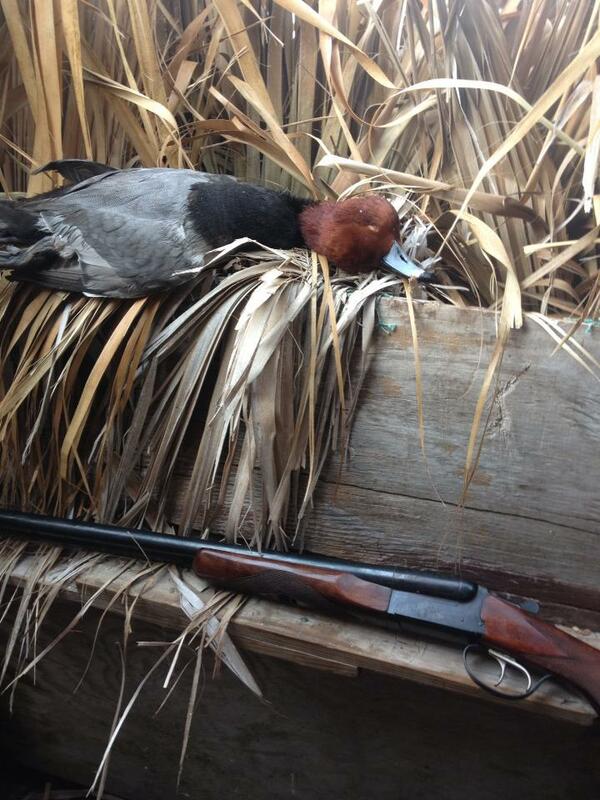 So last year when my friend John invited me to Corpus to duck hunt I originally planned on coming alone for the hunt. However, my wife developed a serious case of house-itosis, so she and the boys came along since I was getting a hotel room anyway. We drove down and that night I left and met up with John for an evening hunt. Though he hadn’t mentioned them, John brought his oldest daughter and son. I didn’t mind at all. I hadn’t asked if this was a kids hunting trip–being the guest and all–and I felt rotten for not packing Oliver’s hunting gear. 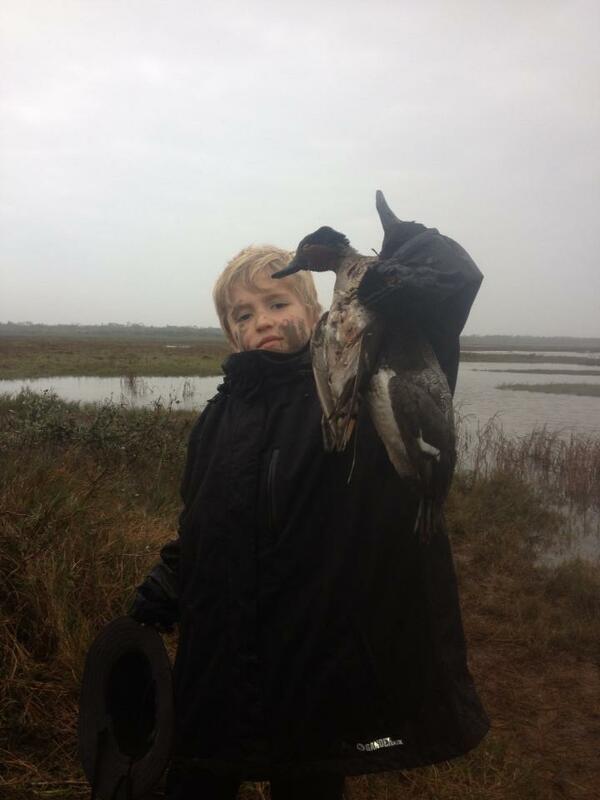 We hunted that night, (more of a scouting trip since no ducks flew over) and I returned to get Oliver as outfitted as I could. Thankfully, Corpus Christi is not cold. That night we pieced together the warmest stuff he had: A fleece sweatshirt on top of his favorite white Longhorn Jersey, a pair of sweat pants under jeans and some blue crocs. Not exactly what you’ll find on the pages of a Cabela’s catalog. 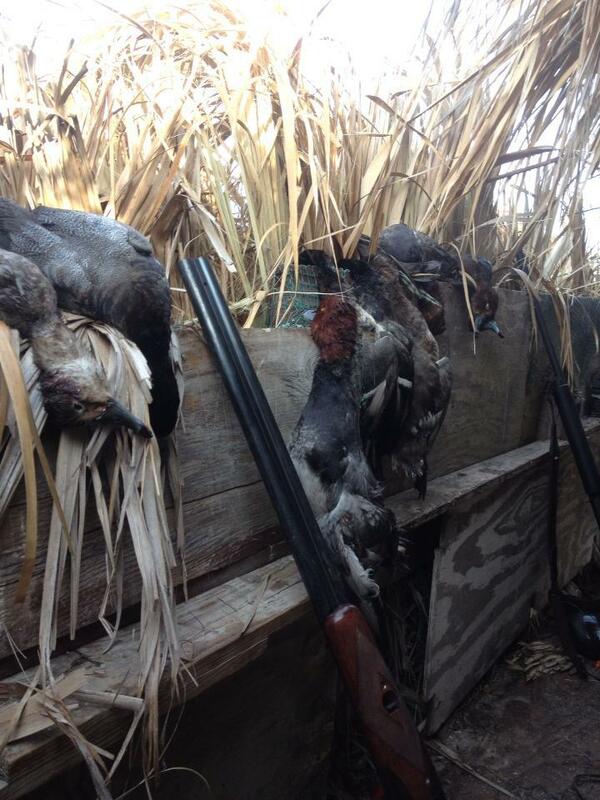 Turns out you can kill a few ducks without camo. Normally, you’d wear a little more camo. However, three limits says its not always needed! “Daddy why did you miss so bad?” The amount of disdain generated in that 6 year old’s voice was impressive. I chuckled and assured him I was in fact trying. Then, cutting through the wind like squadron of Blue Angels, a flock of bluebills bombed us from behind and I was able to redeem myself in my eldest son’s eyes with a double of my own. 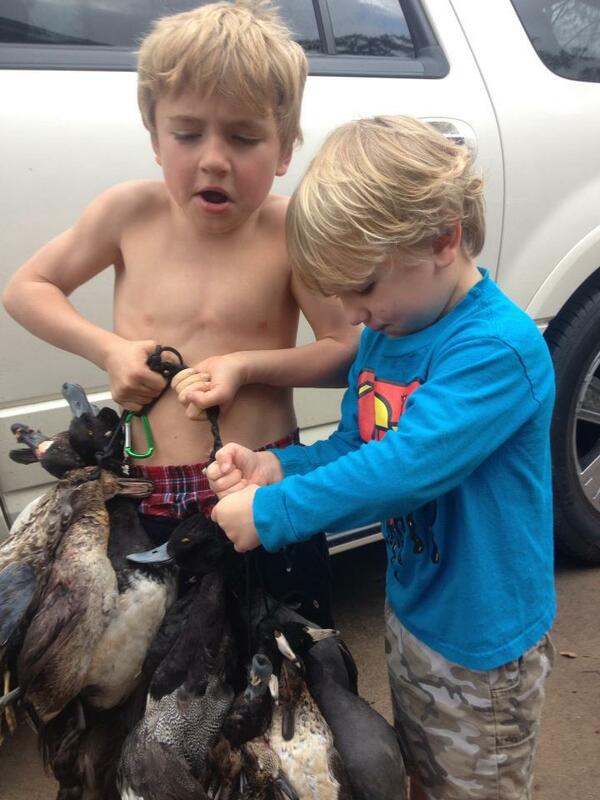 Beards weren’t necessary for these duck killers. 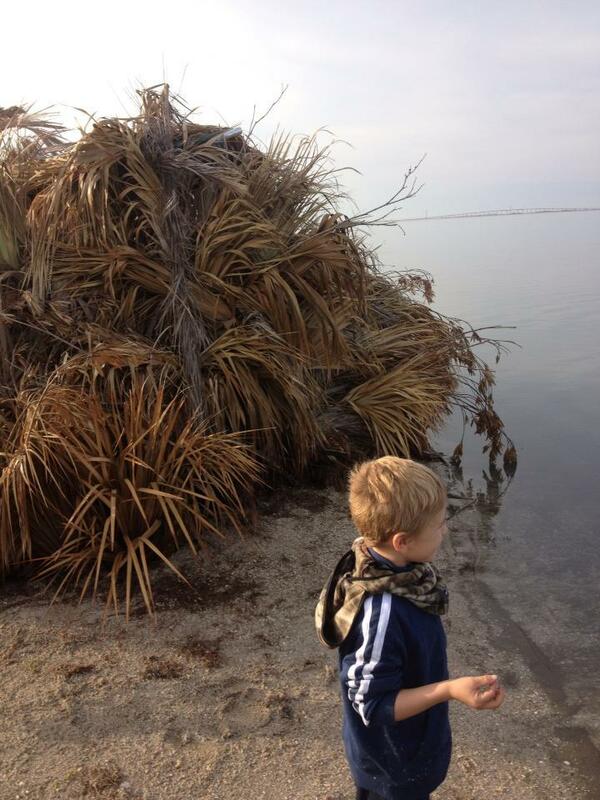 Despite some of our misfortunes, I look forward to spending more time with my boys duck hunting this year. Who took you duck hunting first? Do you have any advice about bringing little ones along? 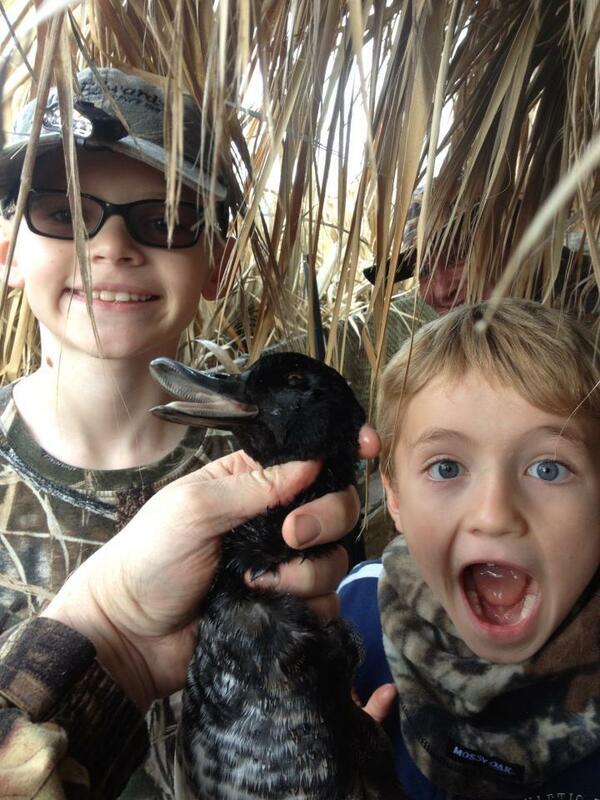 It does my heart good to read how you value the memories you’re making with your junior duckslayers. Soooo much more valuable than a theme park! One hint that I’d like to share (being an ex-school teacher) is to sit the little guys down with their “official” huntiing book (a spiral or the like) and have them write their names inside and a list of what they’ll need for different types of hunting trips. The list can also include cookies, chips, books, comics, and the like as well as boots, gloves, socks, undies. 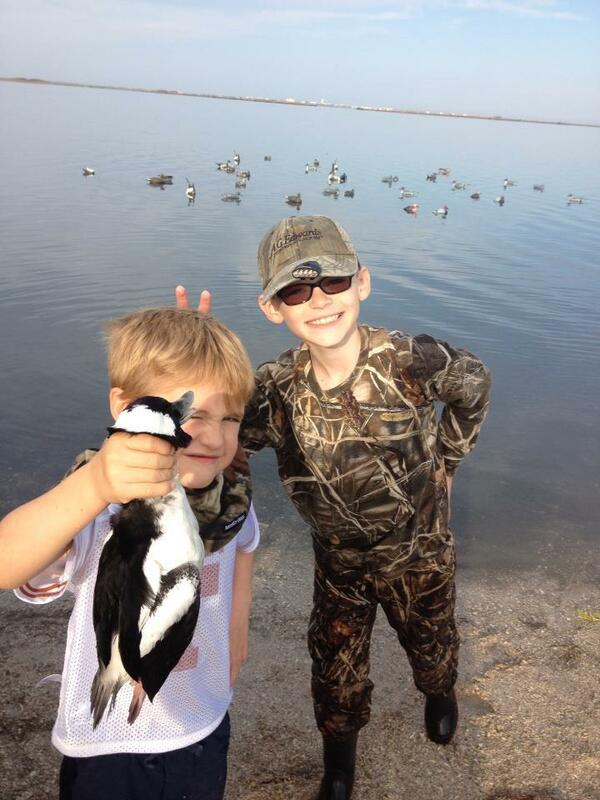 The boys can write down who bagged what on specific hunts, tell funny stories and what they’d like to bring on the next trip that they forgot to bring this time. My junior deerslayer (doveslayer) has a special backpack that she tosses all that stuff in. Once more…. Good for You. I have very fond memories of Duck hunting with my Dad as youngster … looking forward to reading more from you … keep up the good work Sir !